City Officials Get Earful from Residents on Proposed New Jail at 80 Centre St. Residents living near the site of a proposed new jail at 80 Centre St. slammed the plan at the first public meeting on the project, held last Thursday with city officials. Representatives from the mayor’s office attended the meeting, sponsored by Community Boards 1 and 3, to explain the project and answer questions about what is proposed to be part of the de Blasio administration’s initiative to close Rikers Island and open more modern and humane, borough-based detention facilities. But many who crowded into the large hall of the Municipal Building came ready to unleash a volley of opposition. “When you talk about building a beautiful facility, you’re not talking about understanding the impact to our lives,” said Nancy Kong, president of the co-op board of nearby Chatham Tower, the 240-unit complex at 170 Park Row. The plan calls for converting 80 Centre Street/125 Worth Street, which now houses city offices, into a facility that can accommodate up to 1,510 inmates. The sprawling 640,000-square-foot building, which straddles Chinatown and the Civic Center, would be expanded to 1.56 million square feet and could rise as high as 432 feet. Once completed, the north tower of the Manhattan Detention Center at 125 White St. would be decommissioned and available for a yet-to-be-determined community use. In addition, 20,000 square feet of space on the first and second floors of the east side of the building, facing Columbus Park, would be available for community or retail use. 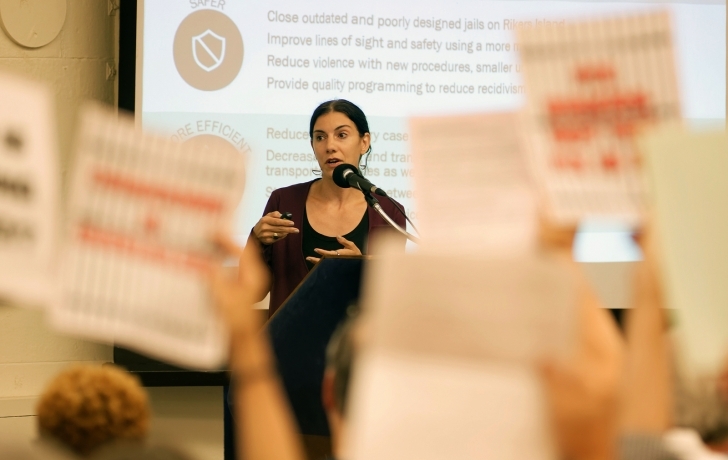 “We are very mindful of how we can best integrate these facilities into the neighborhood,” Dana Kaplan of the Mayor’s Office of Criminal Justice, Department of Correction, told the crowd, some of them holding protest signs. But opponents spoke of fears of crime, traffic congestion, and poor air quality from construction. And they said they are skeptical that future city leaders would bring the project to completion, a goal that is predicated on significant further reductions in the jail population. Kaplan said the administration is confident that its goal of reducing the number of detainees to 5,000 from what now is about 8,300 can be met. The cost, originally estimated at $10.6 billion, will be determined at the end of the year when the master plan is completed. “Obviously it will be a significant capital investment of city funds and financing,” she said. Only last month the city announced it was considering 80 Centre Street as an option for the jail, drawing complaints that the community had not been consulted. “I think a lot people in this room feel extreme anger and frustration that we were left completely out of it,” said MyPhuong Chung, chair of Community Board 3’s Land Use Committee. Following Chin and Brewer’s town hall meeting on Sept. 12, a hearing on the draft scope of an environmental review of the project will be held Sept. 27 at 6 p.m. at the Manhattan Borough President’s office, 1 Centre St., 19th floor. Other hearings will be held as the review process unfolds over the next year. For opponents of the 80 Centre Street site, that engagement is well on its way. According to Patricia Tsai of Chinatown’s Lin Sing Association, the organization has collected more than 1,000 signatures opposing the jail.